Can the United States of America be found in Ezekiel 38-39? The US in Ezekiel 38-39? Nathan Jones: Ezekiel 38 talks about the big Gog-Magog Battle when Russia and Turkey and Iran and some other nations like Libya are going to attack Israel. Verse 13 also lists nations that will sit out the battle, like Dedan and Sheba, which are the modern Arab nations. Also, the merchants of Tarshish are also referred to. Some archeologists believe that Tarshish was the ancient name of Britain. "Tarshish" can also mean "beyond Gibraltar" depending on your translation. Tarshish and her villages or young lions — in other words Britain which then settled Canada and the United States and Australia — these nations of merchants will point out the reason for the Gog-Magog Battle, which is to plunder Israel. Further on in the second Gog-Magog chapter of Ezekiel 39, verse six reveals that at the end of the Gog-Magog Battle after the invading armies are destroyed that God will send fire on the nations that invaded as well as on the nations who feel they lived in safety on the coastlands. Some put together the two references and conclude that the United States is an offshoot of Britain and one of those nations feeling secure that will have supernatural fire rained on them, and therefore the United States can be found right there in Bible prophecy. Is the United States one of those merchants of Tarshish? Are we one of those nations that live in safety and so will have fire poured on our nation? 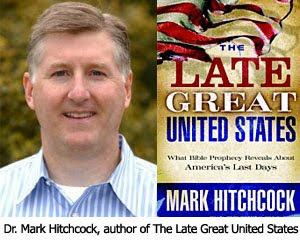 Dr. Hitchcock: Of all the different places where people try to find America in Bible prophecy, Ezekiel 38-39 would be the best one I think. You are right, in Gog-Magog all these nations like Russia and the Islamic nations are invading Israel, but it says that Sheba and Dedan and that Tarshish and the young lions there who are the merchants, they sit on the sidelines and give what I kind of call a lame protest to this invasion. Dr. Reagan: Kind of sound likes the United Nations, or the present U.S. government, because they are asking, "Have you come to plunder?" Dr. Hitchcock: That's right. Their statement shows a laissez faire attitude by asking "Have you come to capture spoil?" Well, it is obvious they have. As you know, the U.N. and others are always giving out condemnations for these things, but not doing anything about them. Really, if you look at Sheba and Dedan being on the sidelines, that lines up with the moderate Arab states today often siding with the West. The issue, though, comes down to where was Tarshish? Tarshish some people take was Spain because that was where Jonah was going. Tarshish was in the opposite direction of Nineveh. We also know the Phoenicians made it to Spain and Great Britain. The young lions would make sense as a reference to some kinds of nations that came out Spain or Britain. And so, if Tarshish is Britain then we could possibly see America as one of the young lions. No one really knows that for sure, though. That is why I would say if you want to find America somewhere in the Bible, Ezekiel 38:13 is probably the best place. But, for me personally, the reference is too tenuous to say that this is America in Bible prophecy. One of the points I like to make is even if Ezekiel 18:13 was a reference to America, or Isaiah 18 was a reference to America, the text doesn't really tell anyone anything about our country. All it tells us is that we exist. Dr. Reagan: Well, I got tickled because I grew up with people teaching me that this was the United States in Bible prophecy. And then, when archeological discoveries in recent years seemed to point to Tarshish as Spain, the people who believe this was a reference to the U.S. said, "Oh, well, it is still the United States because who discovered America? Columbus, where did he come from? Spain. So, the United States is really one of the young lions of Spain and not one of the young lions of Britain." Nathan Jones: Ezekiel 38 would then be talking about Argentina or some other South or Central American country, if that is the case. So, while there's a good chance that the United States is indirectly referred to in Ezekiel 38-39, in certainly isn't directly named. Here's a thought that occured to me. I could be waaaaaay off base, but here goes: The symbol of Babylon was a lion, so maybe the reference to "young lions" could be a reference to nations based on Babylonian culture? not sure thunder. since the apostle paul was from tarshish that leaves out britian. i doubt he was from spain too. frankly, i think the u.s is completely outta this which is why i further believe this battle is AFTER the rapture. (before the trib tho) i think america stays strong til the rapture. You make me go "hmmm," Thunder. Very thought provoking. forgive me for getting just a little off topic but i find it interesting: i couldnt sleep so i`m eating lunch at a pizza place and its really slow so the people in the kitchen are having a random discussion. one says "if you could annihalate one nation what would it be? (in a joking way) unanamousely its isreal. one says why? answer, they`re the cause of all the trouble. why anger millions of muslems for one tiny nation? get rid of them you solve the worlds biggest problems. there were other stupid reasons but thats the thinking. (at least around here) thats where the u.s is in prophecy AGAINST ISREAL. Hartdawg, that's the mind-set here in the Biblebelt too. If you take Israel out of the equation, then the muslims will settle down and the war on terror will be over. I think that's part of the problem, hart. The Bible clearly states that God will bless the ones who bless Israel and will curse the ones who curses them. This nation will not bless Israel and we are suffering for it. "Sheba, and Dedan, and the merchants of Tarshish..."
Sheba and Dedan are positively identified to their current age nations, so the key phrase here is "and the merchants of tarshish" which in the original Hebrew is "chachar Tarshiysh" literally meaning "to go about in business/trading Tarshish." I would say that Ezekiel's use of Tarshish needs to be interpreted according to Ezekiel 27. Tarshish is noted for its ships, ship of sea-faring commerce to be precise. And the origin of these ships of Tarshish are distinct from all of the other named nationalities. What are the greatest sea-faring commerical nations in history to the west of Israel (the direction in which Jonah was going)? thereof" to be a direct reference not to the United States per se, but to all of the former colonies of these three nations in the Western Hemisphere. Of these Western Hemisphere "young lions" or "villages" the United States of America is the greatest of all time. can mean this, but in the context of Sheba and Dedan which are literal districts in Southern Arabia so 'kĕphiyr' means all the 'villages' within those districts. Sorry, but nothing to do with Britain the U.S., or any of our former colonies. "when i overheard them i couldnt believe my ears." The "strong delusion" is coming up to speed... Not too much longer. Sorry, forgot to add that the context of Tarshish relates to trading. It is the news items that are passed around by the merchants, and the reactions at all their many 'ports of call' to the news within Sheba and Dedan. Genesis 10:7: 25:3; 1Ch.1:9;1Ch.1:32 tells us they are descended from Cush who was, I think a black man, also via Keturah the concubine of Abraham whom, I understand was also black. Would the U.S. sit out an attack on Israel? In the past the ONLY answer would've been NEVER. But with B.O. (p.u.!) in the White House I would say...YES! Absolutely! B.O. is NO friend of Israel and will not defend her. B.O. stinks! Imo Obama is not the real problem. 'They' needed a puppet to manipulate their plans into position. Effectively 'ignorant' of the process of politics, his immaturity as a man and a politician is what 'they' are using to advantage. A major problem for the world is Islam, and Obama has fitted the bill nicely, and being a black man, is an added advantage at this time in history. When Islam is severely curtailed by the Isaiah 17war, I fear for Obama, and his family, as I think he will then outlive his usefulness to ‘them’ and they will chuck him to the ‘dogs’ for another use. Next time, to appease the growing disgruntled by ‘his’ failing policies that so suits ‘their’ agenda; failing policies being a part of the great plan to neutralise past and present ideologies meant for the scrapheap. Meanwhile Obama is convenient for the appeasement of the Muslims and other minority groups. EI, I think you've got a greater understanding of what's going on over here than you might think. In many places, you echoed my thoughts how the Obamassiah got elected and why. I figured out early on that he's a puppet of Harry Reid and Nancy Pelosi and whoever is controlling them. That Shadow Government that Grant Jeffries talks about, maybe? Thank you for not being cross with me, I don't want to be disrespectful. I read somewhere else that US Christians don't want to pray for Obama and I found that too harsh for my taste - poor bloke! I have some of GJ's books, but not that one, so I don't know those names. Once my purse has revived from Christmas, I must try and buy it. Thans again. nofog, or whatever your real name is, i never caught the different spelling. if tarshus is spain then perhaps, just maybe europe ane the u.s is referenced. e.i you should try and read isrealstine, or at least skim thru it. http://www.christiananswers.net/dictionary/places.html and typed Tarsus in the search window. ...so bad that American Express called me and said, "Leave home without it!" ...so bad McDonald's is now selling the 1/4 ouncer. ...so bad Exxon-Mobil laid off 25 Congressmen. So DrNofog is careful with the pennies huh? When he wakes up, he will be checking under the bed to see if he lost any sleep. ...so bad that when I ordered the quarter-ounce burger at McDonalds, the kid behind the counter asked, "Can you afford fries with that?" ...so bad parents in Beverly Hills fired their nannies and learned their children's names. ...so bad Motel Six won't leave the light on anymore. ...so bad the Mafia is laying off judges. ...so bad a truckload of Americans was caught sneaking into Mexico. I find it interesting that Babylon's symbol was the lion and today, the nation that uses that symbol is England. So, if Babylon is the old lion, then England, Canada, Australia would be the young lions...and possibly the US, though their symbol is the eagle. Prior to the adoption of the Eagle as the national symbol, it was the Lion. This heraldic symbol remains today dotting the landscapes of many front lawns of the wealthy and influential.